Clarence was the assistant wizard of Zavistic Rarve, before he met a grizzly end. 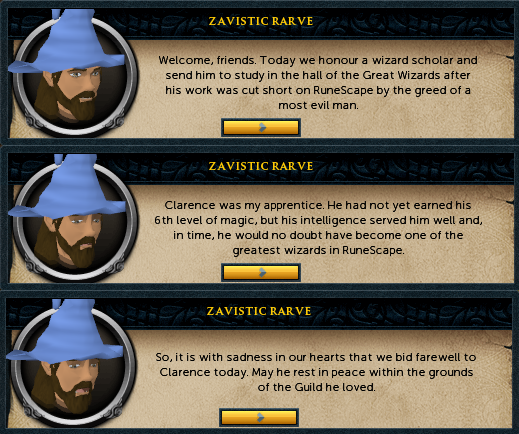 Pieces of his body were scattered around RuneScape, and now you must find the rest of his body, return them to Zavistic Rarve, and set Clarence to rest. 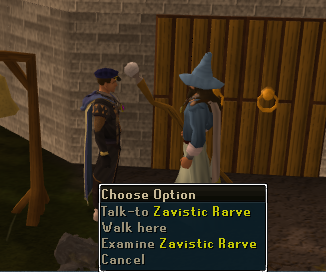 Speak with Zavistic Rarve in the Wizards' Guild, or ring the bell outside of the guild. If you remember from the quest, Hand in the Sand, a wizard named Clarence was murdered and you found his hand in a pile of sand. At the end of the quest, you collect his head and return it to Zavistic Rarve, a member of the Wizards' Guild. During the quest, Back to my Roots, you find the other severed hand, which also belongs to Clarence. Once you find the hand, you can continue to complete Back to my Roots, or you can start this mini-quest. 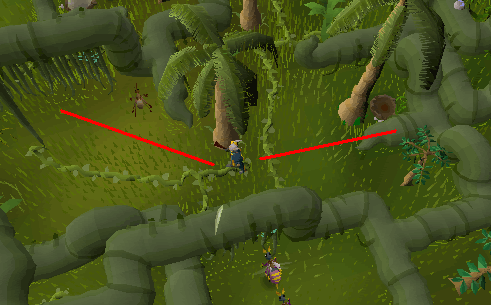 If the Back to my Roots quest is completed, you can obtain another hand by killing more creatures in the Jade Vine maze. When you're ready, speak with Zavistic Rarve with the severed hand in your inventory and select the option, "I have a rather sandy problem that I'd like to palm off on you." You can enter the Wizards' Guild and talk to Zavistic (Level-66 Magic required), or you can ring the bell outside for his service. Note: If you haven't started the quest, Zogre Flesh Eaters, then you will start the mini-quest as soon as you start speaking with Zavistic. If you have completed the quest, or just started it, then you'll need to select the option method above. If you do not have the severed hand, click the same option and continue through the conversation. Once you've finished talking, scroll down to the "Finding the Body Parts" section of this guide, read the information, and begin hunting for the parts. You will exclaim that you have found something, and that "something" is a hand that belongs to Clarence. You will show the hand to Zavistic and he will take it off your hands. Next, both of you will discuss Clarence's body. Apparently, the Wizards' Guild has not buried the remains of Clarence because they want to find him as a whole for the Wizards' Great Hall. You will then be given the task of finding the other body parts. You will be fighting level 50-70 monsters in this next part, so gear up correctly. 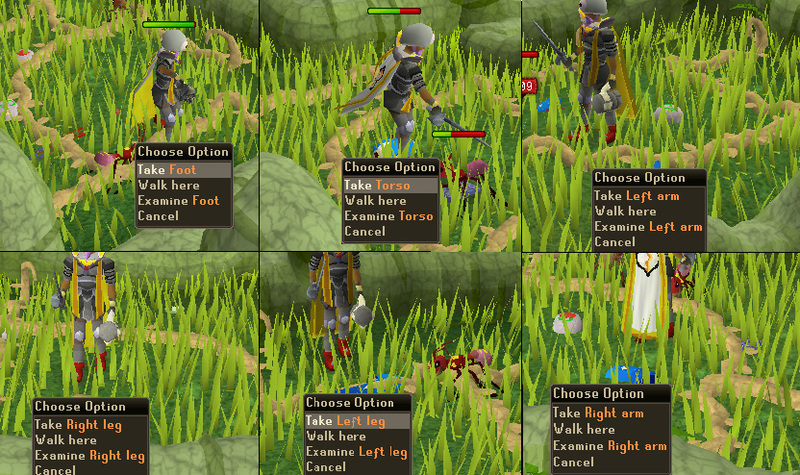 Once you are properly prepared for fighting, travel to Karamja using your preferred method. 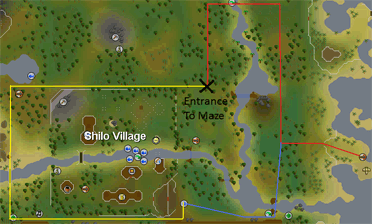 Below is a map that shows how to reach the maze's entrance starting at Shilo Village. [Picture] Climb up and enter the maze. [Picture] Move east and climb up. [Picture] Head south and climb down. [Picture] Walk south to another vine, move east, move south, climb down. [Picture] Go south as far as you can. Turn west and cut down the vines. [Picture] Crawl through the vines. 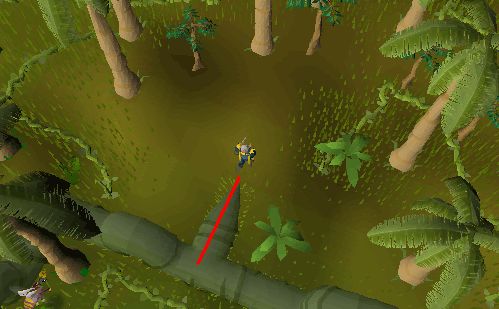 You are now in a preferable giant ant slaying area. Nothing special is required here. 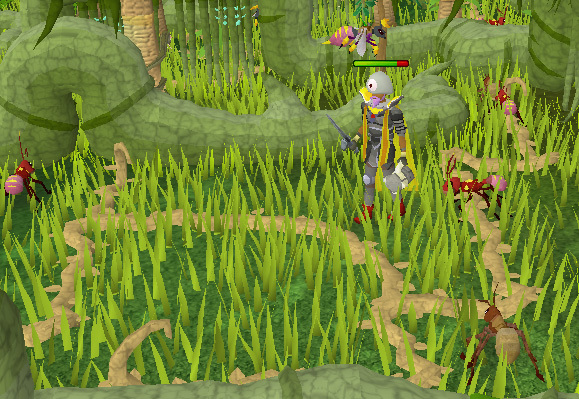 Simply slay giant ants until you have all six of the body parts. The six parts include the torso, left arm, right arm, left leg, right leg, and foot. 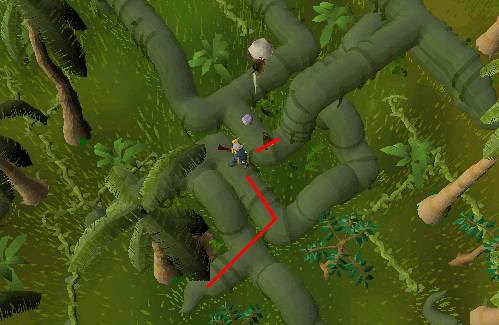 If you destroyed the severed hand during or after the quest, Back to my Roots, you'll need to spend some extra time killing giant ants to receive a hand drop. All of the parts are occasionally dropped. If you run out of food, feel free to restock and return to slaying after. Once you have the six (or seven) body parts, return them to Zavistic Rarve. Despite the lack of one foot, the Wizards' Guild has decided to finally put Clarence to rest. However, there is still one task left. Sandy, Clarence's murderer, awaits trial in Seers' Village. The members of the Wizards' Guild need more evidence to prove him guilty of his crime. Zavistic will ask you to search through Sandy's office in Brimhaven and find some more evidence. 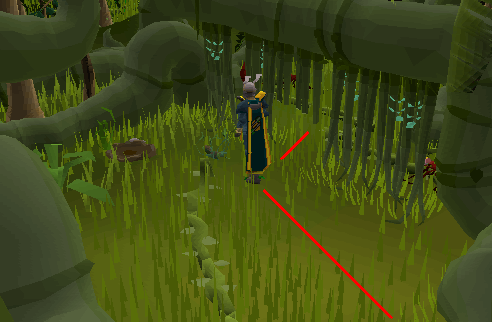 You can teleport to Karamja and head to Brimhaven yourself, or accept a free teleport from Zavistic. It's a wise idea to accept Zavistic's teleport, so do so. While you are searching, the Wizards' Guild will be preparing a ceremony. Zavistic's teleport will place you in Sandy's office on Karamja. Your task is to find some evidence that will prove Sandy guilty of his crime. Search Sandy's desk against the southern wall and you will find a locked diary. The diary has four options: Unlock, Use, Destroy, and Examine. Use the Unlock option. Your character will attempt to unlock the diary. If successful, the diary will open and you can read it. If failure, you will lose one-half of your current Life Points. Once you've failed once, it does not guarantee your second attempt will be successful. You can fail more than once, so be watchful of your current Life Points. Once you've opened the diary, skim through the pages of the unlocked diary until you've finished reading the entire diary. You'll learn that Sandy had hard times running a business and the reasons why he killed Clarence. 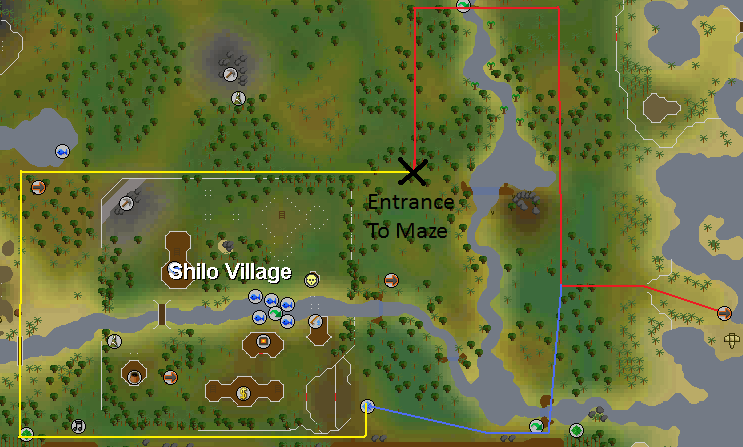 Head back to Zavistic Rarve in Yanille and present him with the diary. At first, Zavistic will not understand why you have brought him a diary. He will mock the diary, thinking it does not provide enough evidence. After explaining to Zavistic what you found in the diary, he will exclaim with glee that there is enough evidence to punish Sandy. Hand over the diary to Zavistic. Congratulations, you have completed the first part of the mini-quest. You will now receive your first reward: 100 Law Runes and 200 Blood Runes. After receiving your 300 Runes, Zavistic will invite you to attend a special ceremony. The Wizards' Guild is going to put Clarence to rest. 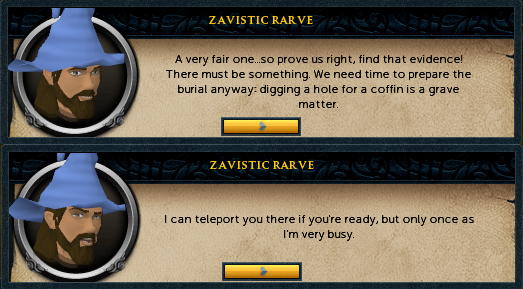 You can attend the ceremony by accepting Zavistic's offer, or you can decline and continue to travel RuneScape. It is recommended that you attend the ceremony, as there is a special reward at the end. Most of you will accept the lovely offer to a beautiful ceremony. Once you accept, your screen will fade into black and a cut scene will begin. 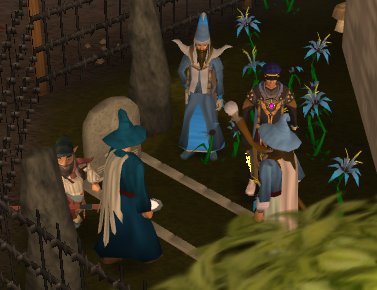 The ceremony will begin with a gathering of the wizards in the back of the Wizards' Guild at the burial spot. Each of the wizards will say something in honor of Clarence. Zavistic, though, does the most talking and says the most meaningful words. Once the ceremony is over, the wizards will use their magic to bury Clarence. You will be thanked by Zavistic and will be rewarded with 10,000 Experience to your Magic skill. The cut scene will end and you will have completed the mini-quest. Congratulations! [^] Speak with Zavistic Rarve of the Wizards' Guild by ringing the bell outside. Tell him about a sandy problem. [^] Give him the severed hand and continue through the conversation, or move on to the next step. [^] Equip yourself with strong armour, weaponry, food, potions, teleport runes, and a machete. 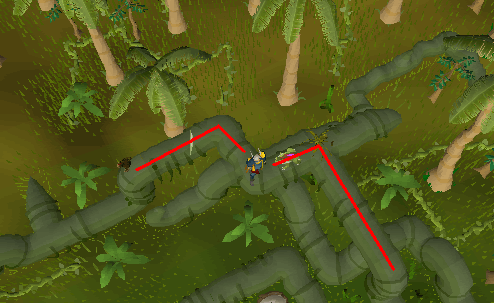 [^] Travel to the Jade Vine Maze on Karamja. 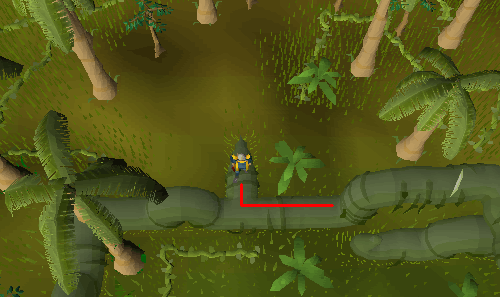 [^] Navigate your way through the maze to an area with many giant ants. [^] Kill ants until you have all six (or seven) of Clarence's body parts. [^] Return to Zavistic and give him all the parts. Accept his teleport to Sandy's office in Brimhaven. 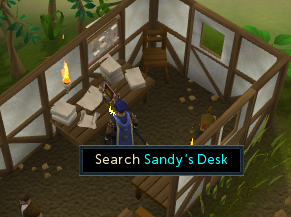 [^] Search Sandy's desk until you find a diary. [^] Open the diary. You might fail and lose many Life Points. [^] Skim through the diary and return it to Zavistic. Accept your first reward of law and blood runes. [^] Accept the invitation to Clarence's ceremony. A cut scene will start. [^] Collect your second reward of 10,000 Magic experience.